50-Year Anniversary of the T2 Bay Window Bus! Ok, this blog post comes a year late, but the buses below are so beautiful that I rather post them late than never. So, last year the bay window bus or T2 turned 50. 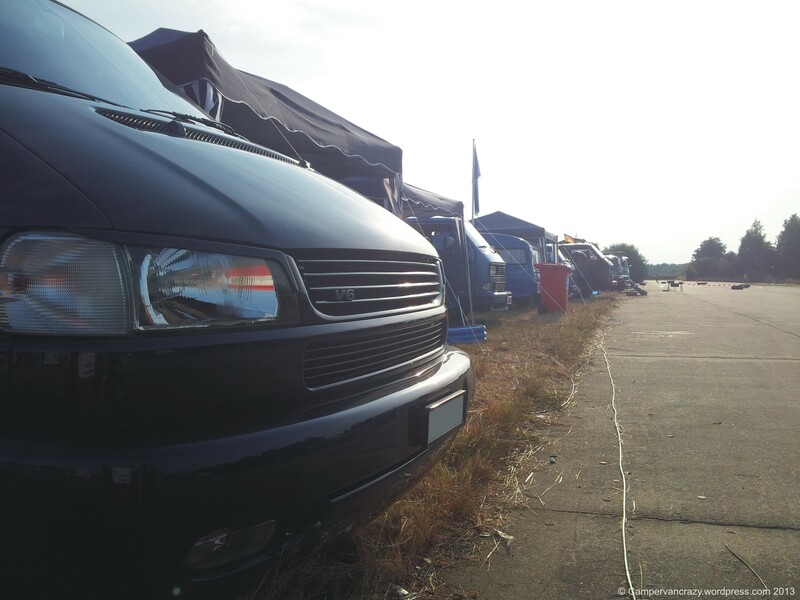 I joined the German T2 owner’s club, the Interessengemeinschaft T2 and at the end of August our little family took part in the annual club meeting in Hannover. In the Hannover Volkswagen factory the VW transporters have been built since 1956. I don’t get the exact numbers together anymore but we were told that of all of the six generations of buses that have been or are being built in this factory, the T2 was the bus generation that was built there in the highest numbers. 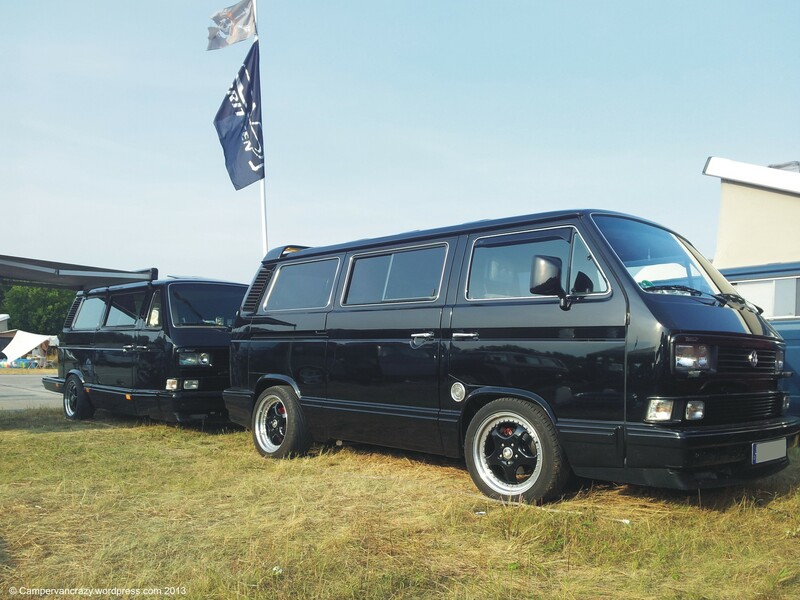 And on the occasion of this club meeting, the T2 club had the privilege to drive, in a convoy, through the Volkswagen factory site. 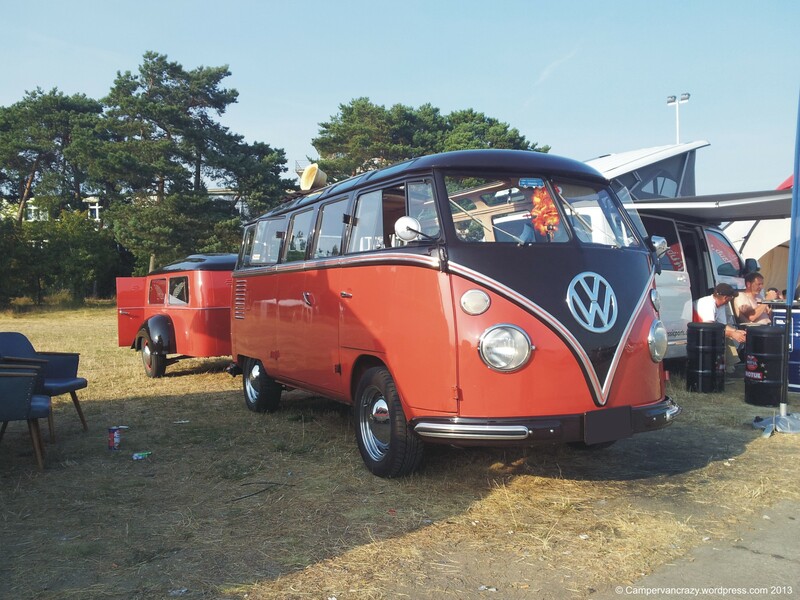 So on the second day of the meeting, about 80 VW buses started from the camp ground to the factory, gathered in front of the factory, drove in convoy thorough the factory and assembled again in front of it for official photos (which can be found e.g. here and here). But that’s enough background, here come the promised photos. Enjoy! 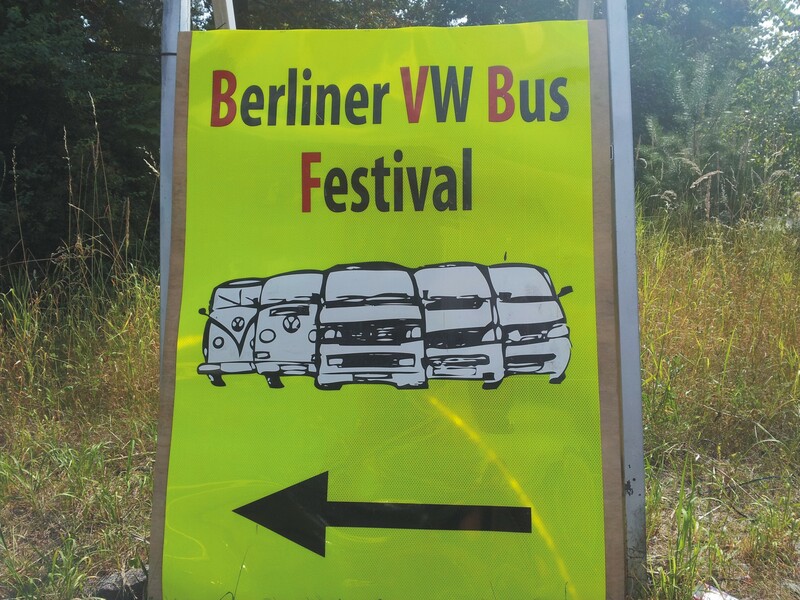 Berlin Bus Festival 2014 Coming Soon! 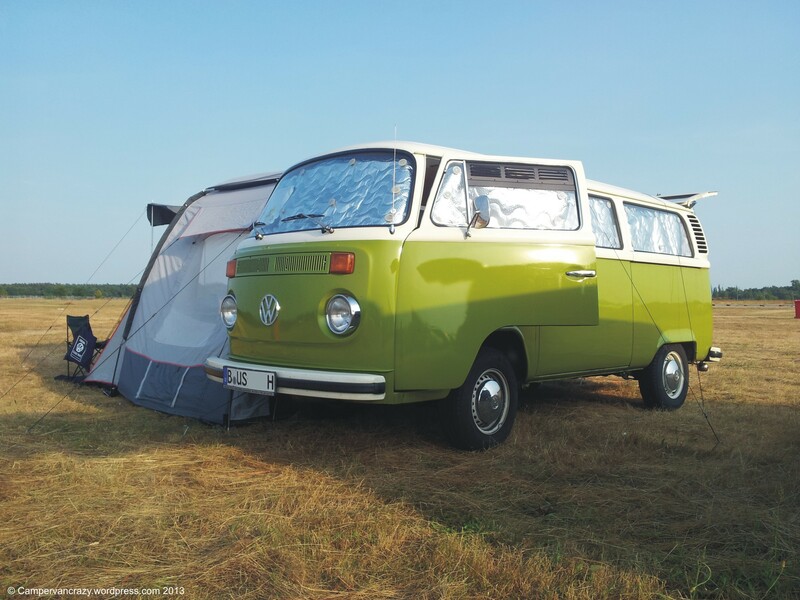 A quick note for all VW bus fans who happen to be in Berlin next weekend: From Friday Aug 15 to Sunday August 17, the 7th Berlin VW Bus Festival will take place on the Jueterbog airfield, about 70 km south of Berlin. Very relaxed meeting, lots of friendly people and beautiful buses. All details on the festival web site and on the festival flyer. More photos from some previous meetings in these older posts. Looking forward to see you there! We are back to Australia for a couple of weeks, visiting family and friends in Geelong and Melbourne. From German spring to a still very warm and sunny Australian autumn. 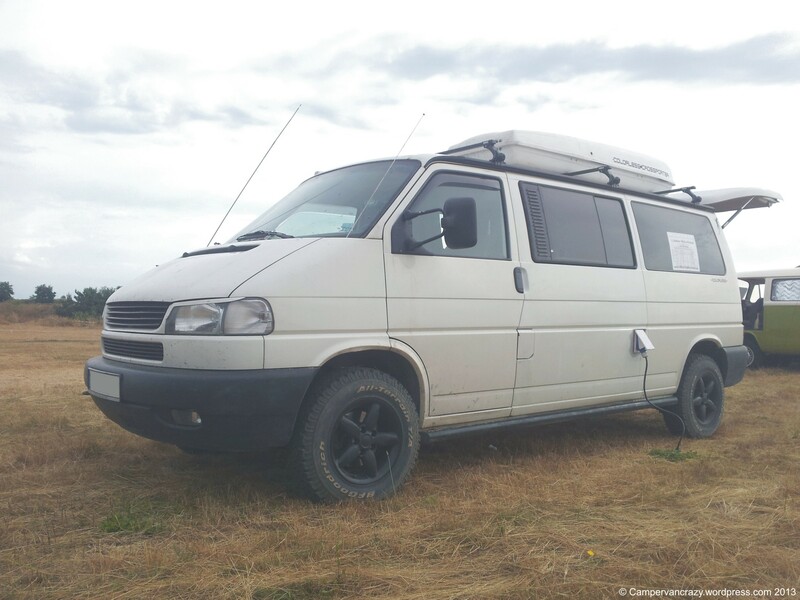 There are less and less VW buses on the road each time we come over, but you still see many more than in Germany. 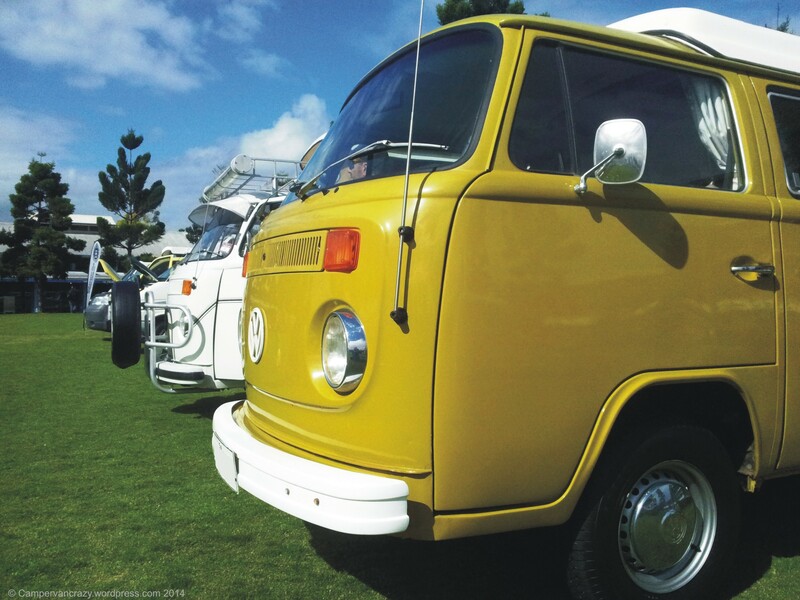 And last Saturday all my wishes came true and we found a VW festival with show and shine event right here in Geelong, at the water front. 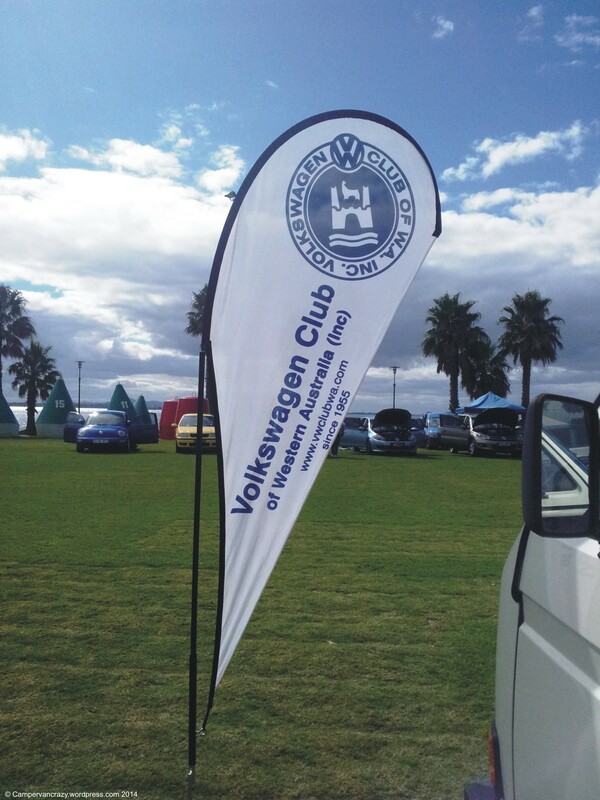 Lots of people from the VW Club of Western Australia. 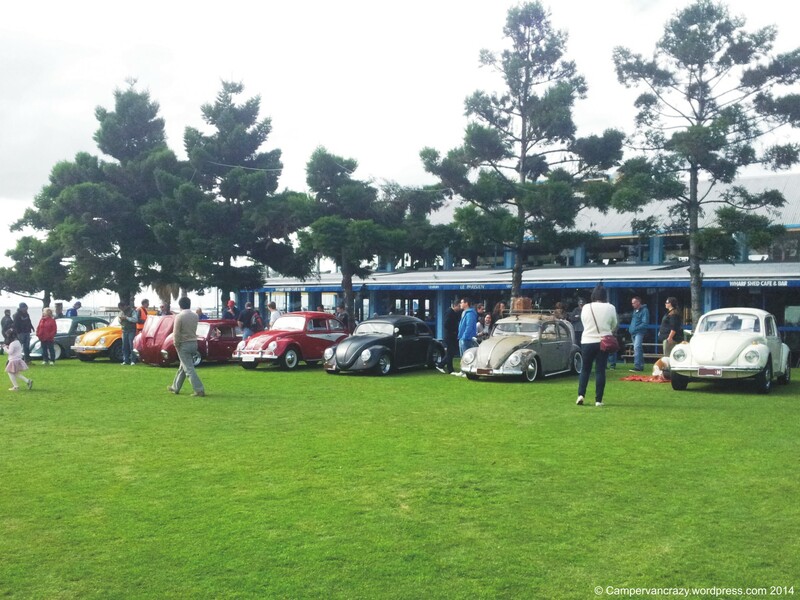 Just learnt from their web site that this was the National VW Club Bug-In, a Volkswagen meeting hosted by a VW club from a different state every year over the Easter weekend. 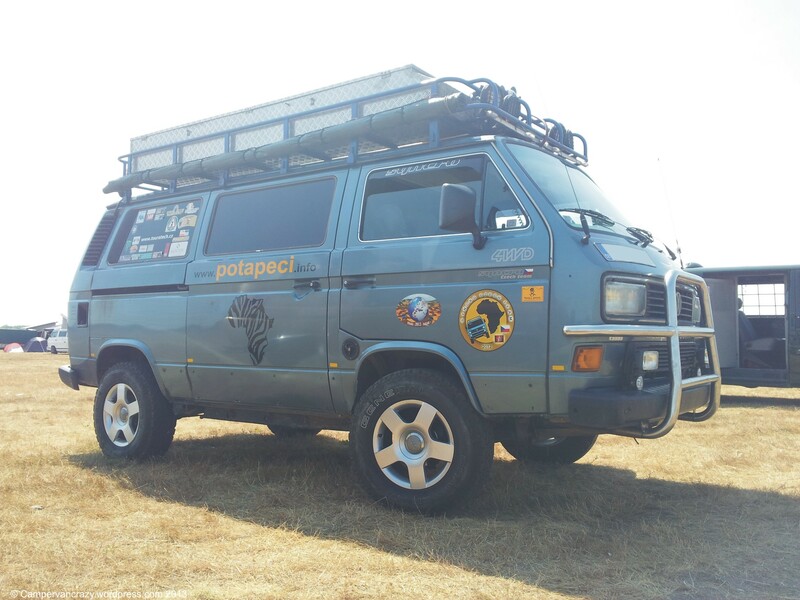 Great buses, great weather, and fantastic to speak to fellow VW fans at the other end of the world! 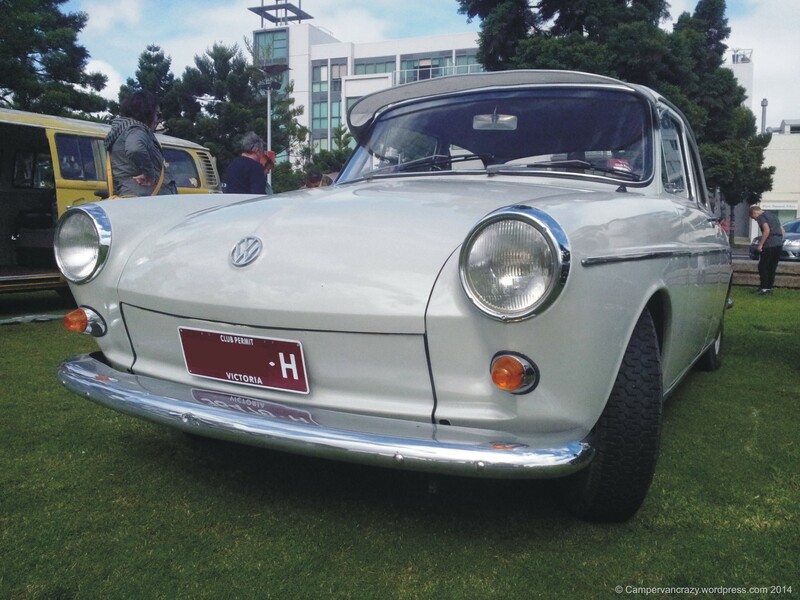 Below is a first set of snapshots, including a beautifully restored VW type 3. Will post on some of the buses in more detail soon! 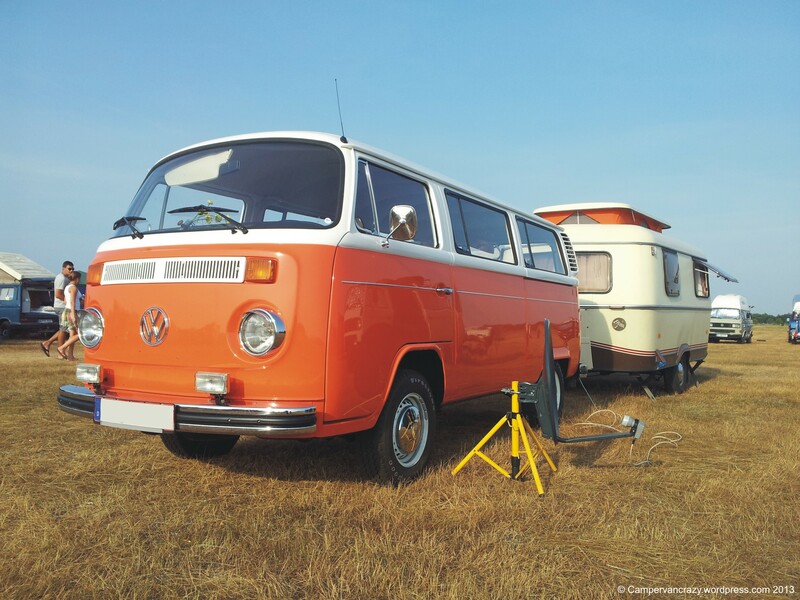 We have just returned from the 2013 Berlin Bus Festival. Two and a half very nice and very hot days of camping and admiring buses. And the first nights in the bus with our almost two-year-old baby daughter sleeping in the new bunk bed in the front. Which actually worked out very well. With the baby we took it all easy and did not take part in any of the different competitions. Focus was more on finding and petting dogs (her main interest, and there were many dogs) and checking out buses (my main interest). I noticed many more bus-trailer combinations this time – either with classic trailers re-sprayed to match the bus, or with the trailer made from a second copy of the same type of bus. 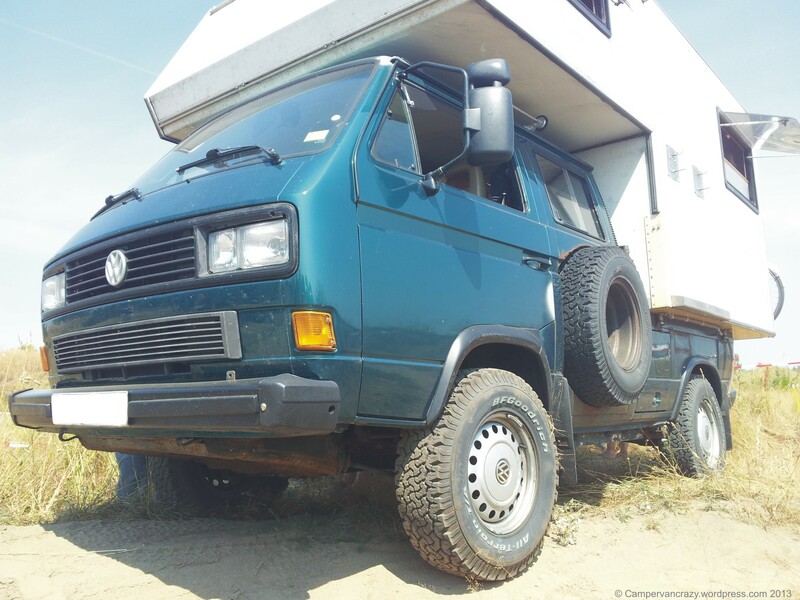 And then there were syncros, the four wheel drive version of the T25/T3. A lot of them, and they can be quite impressive monsters. Finally, there were a lot more T2s than at the previous meetings. It is still a T3/T25 dominated event, but nice to see the T2 numbers going up. Hope you enjoy the fotos! PS: And there are some more photos in this Flickr album. 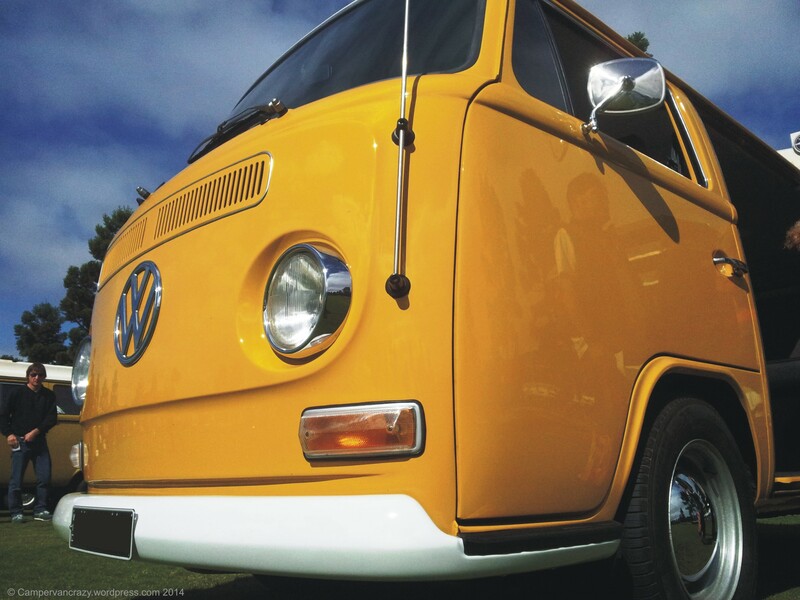 Our bus, Taiga Lily, a 1976 Late Bay microbus. 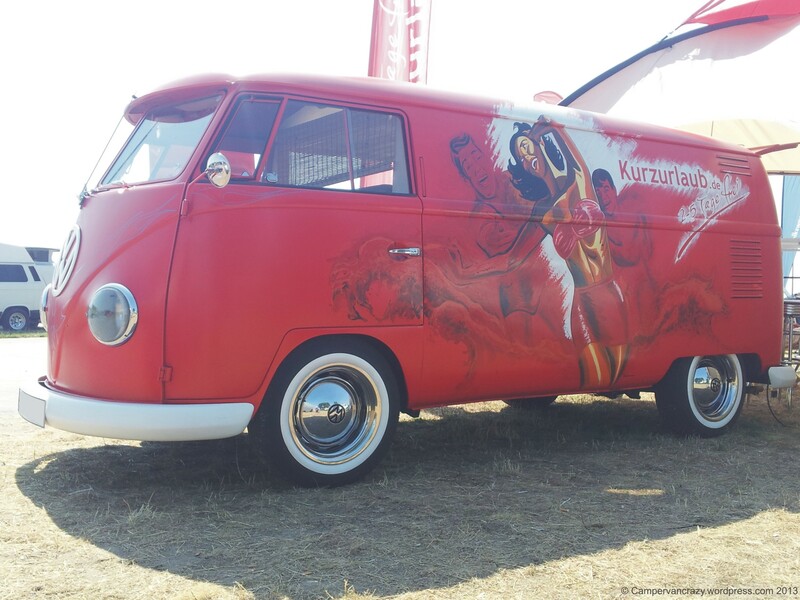 Early splittie from 1959, used as promo van for an internet travel portal. 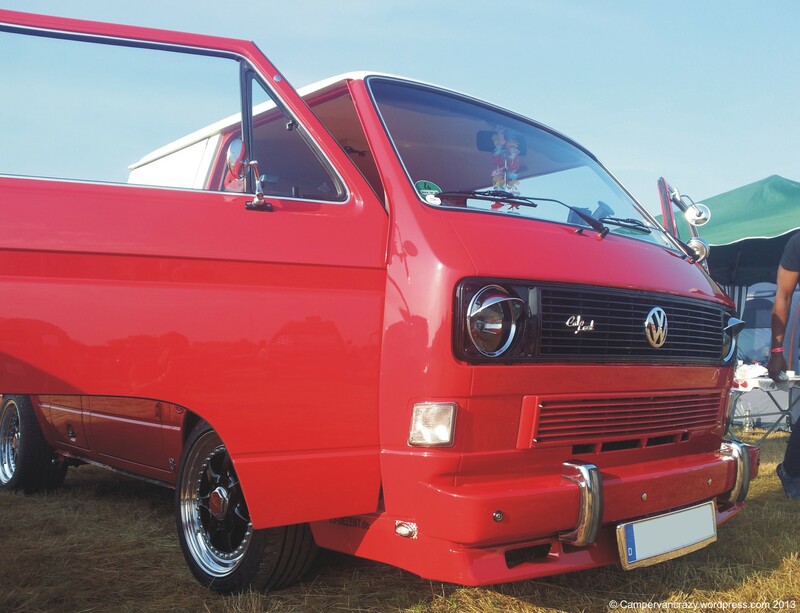 Red and white T3/T25 double cabin with Audi V8 engine. 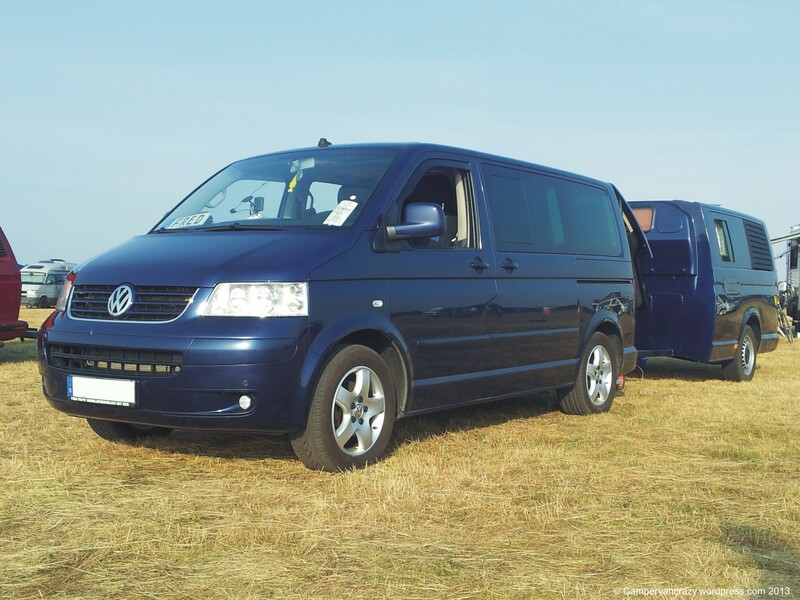 T3 Blue Star Hanover edition, bus of my best mate Jan, ready for a two week camping trip to Northern Italy. Early T1 Samba bus with hearse trailer, turned into an extra bed room. Late bay with Eriba Puk trailer. Late bay with larger Eriba trailer. 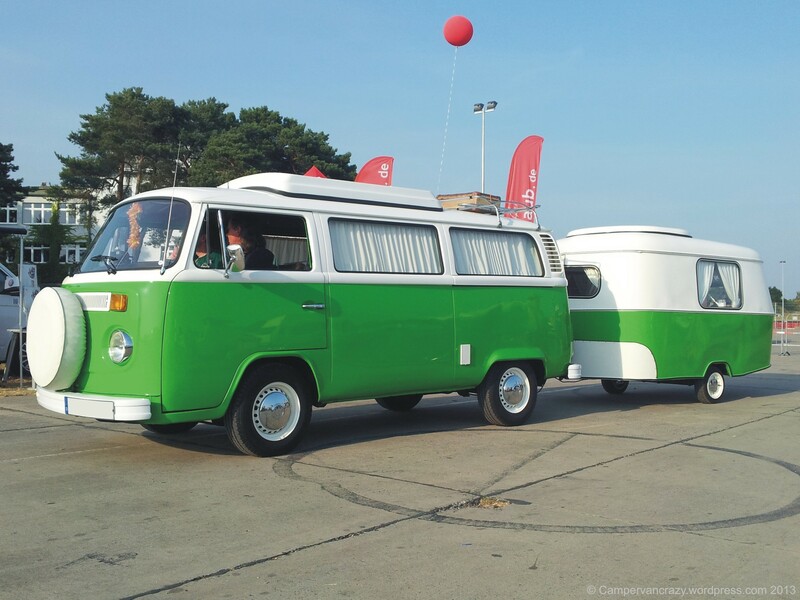 T3/T25 microbus with matching T3-derived trailer. T5 bus with T5-derived trailer. 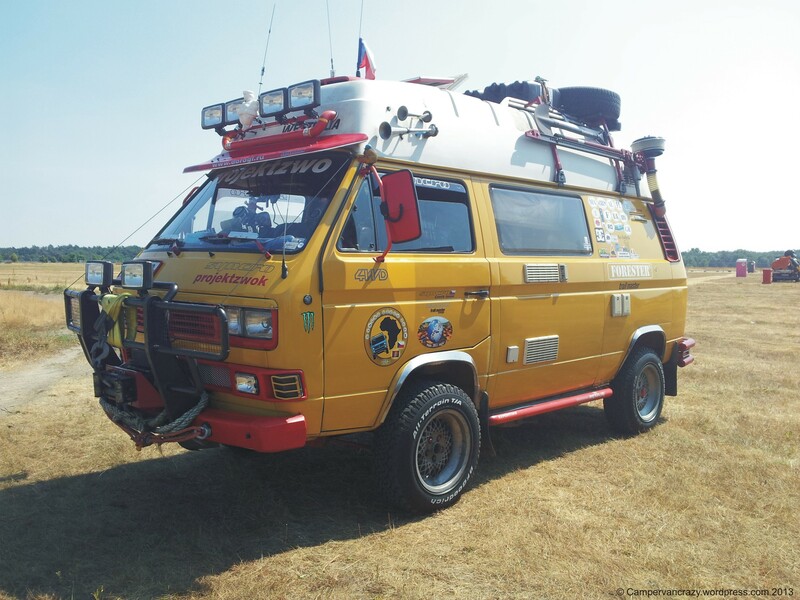 T3/T25 syncro four-wheel-drive bus from the Czech Republic. 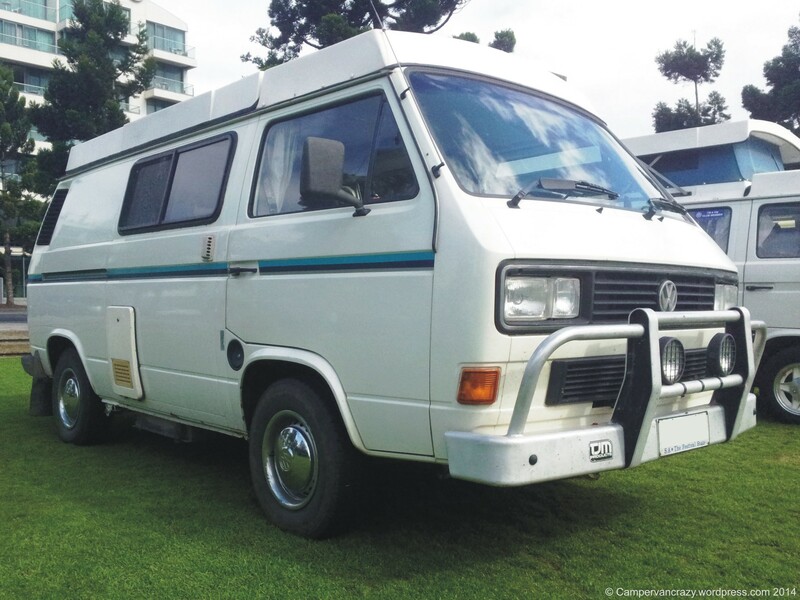 The “Colorless Crossporter”, a T4 Syncro bus. 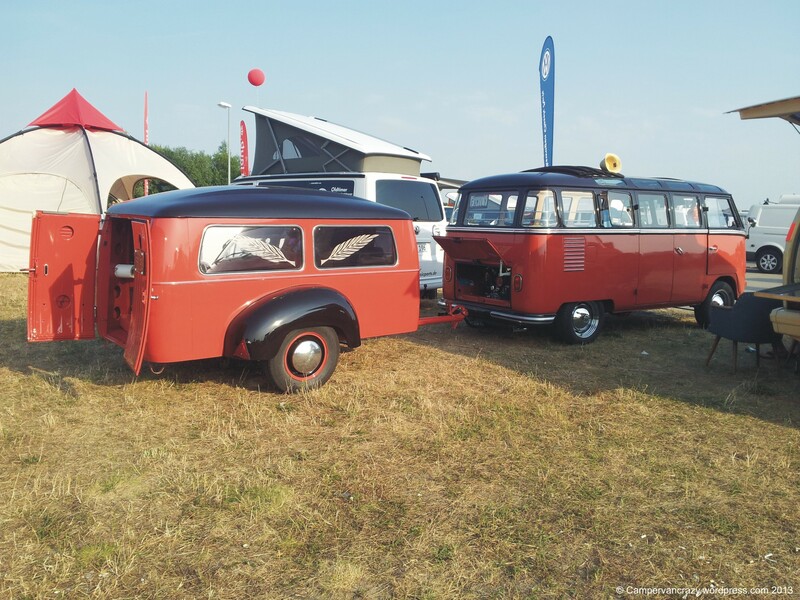 A 1951 reproduction from East Gemany of the Volkswagen T1 split-window bus, built onto the chassis of a 1943 Kübelwagen. Following Wikipedia, the Kübelwagen was a light military vehicle produced in Germany in World War II which in turn was based heavily on the early beetle prototypes. 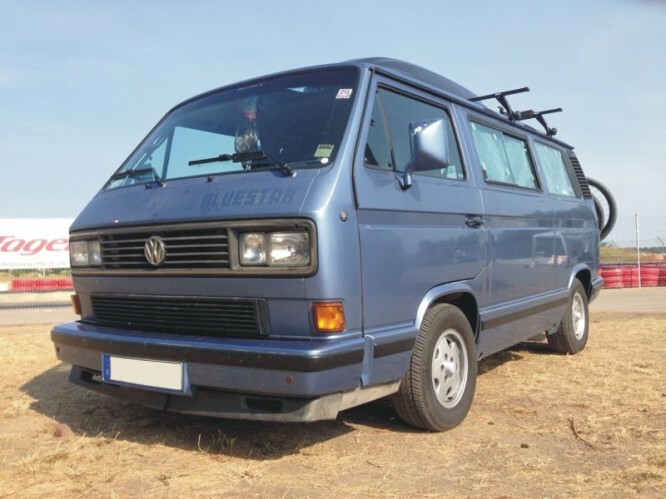 This microbus reproduction comes with a full-wooden bodywork and an original Volkswagen 1131 ccm air-cooled flat-four rear engine with 24.5 H.P. The front doors seem to be “suicide doors”, with hinges in the back. Strange that it features already front indicators. 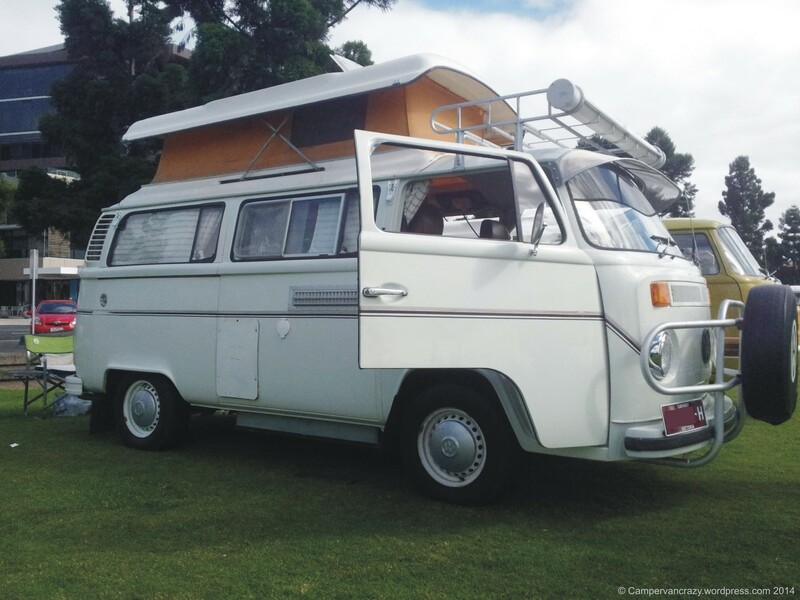 The original split-window got them only in 1960. Perhaps they were also added later to this bus? 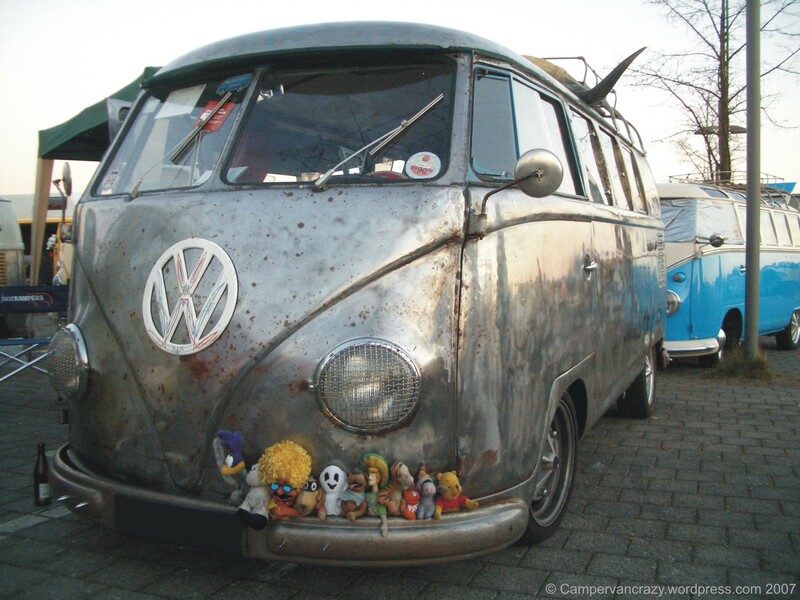 The photo was taken in 2007 at the 60-years-of-VW-Bus festival at Hannover in Germany. 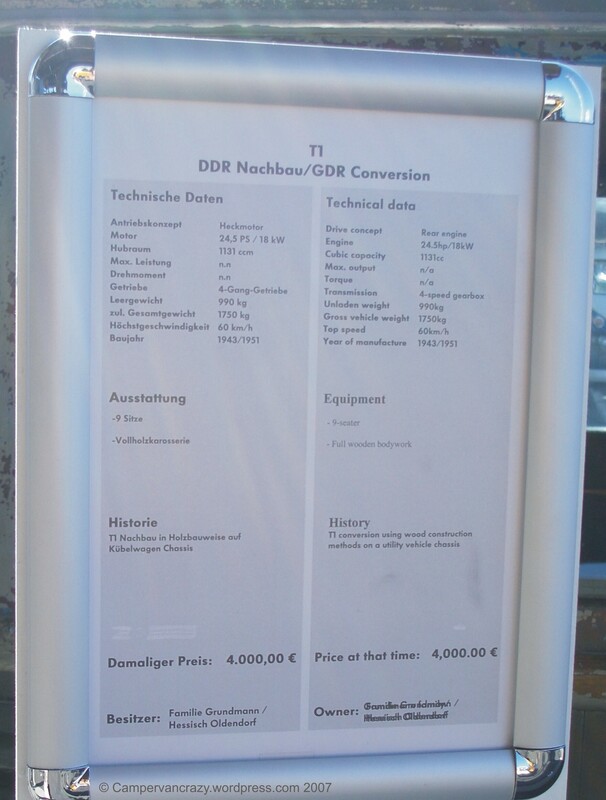 More background information in English and German on the second photo. Quiet a remarkable van. 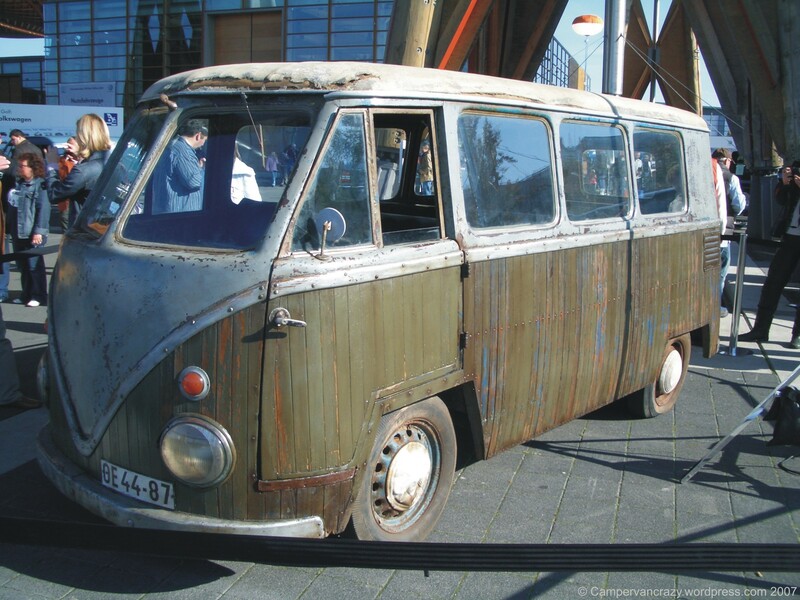 Here is a snapshot from the 60-years-of-kombi anniversary in Hannover in 2007. 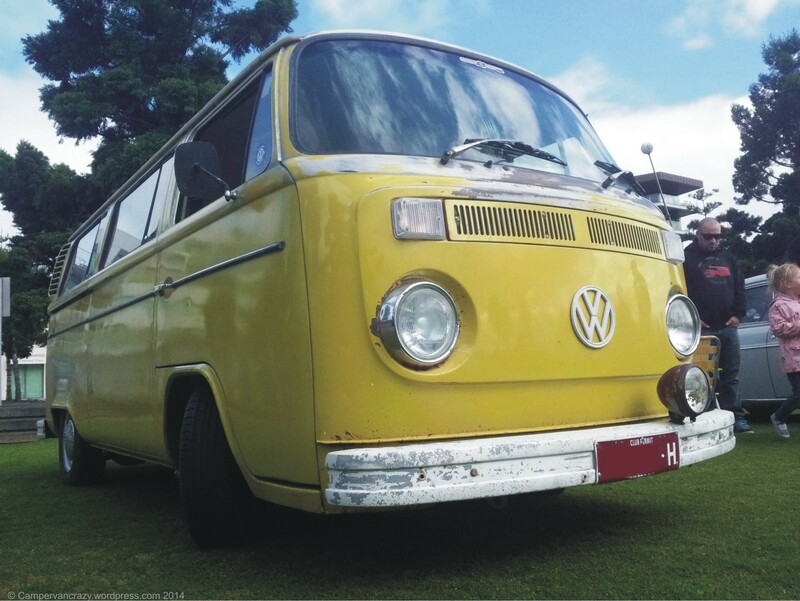 A split-window from England, with the paint fully sanded off and then protected with clear varnish. A pre-1960 model without indicators on the front. 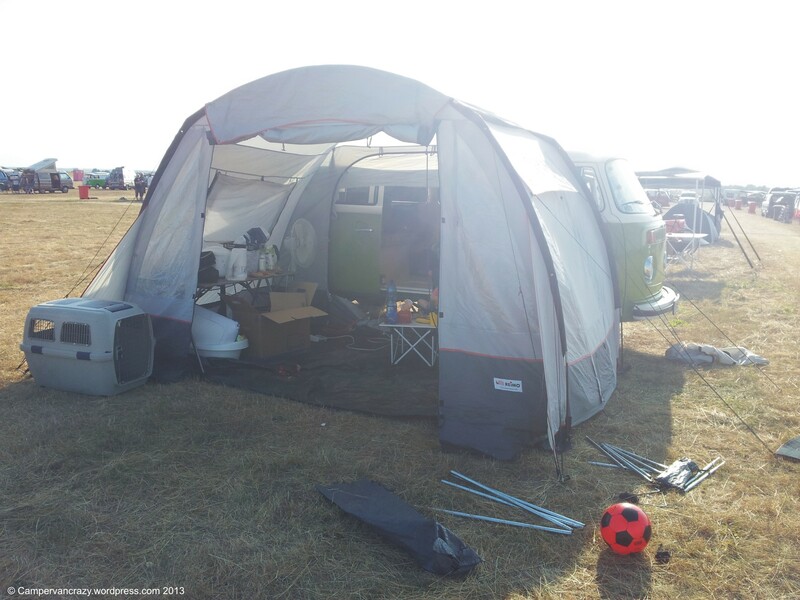 Looks like a Westfalia roof rack in the back, Fuchs wheels and huge bull horns on the roof. What a very cool bus! 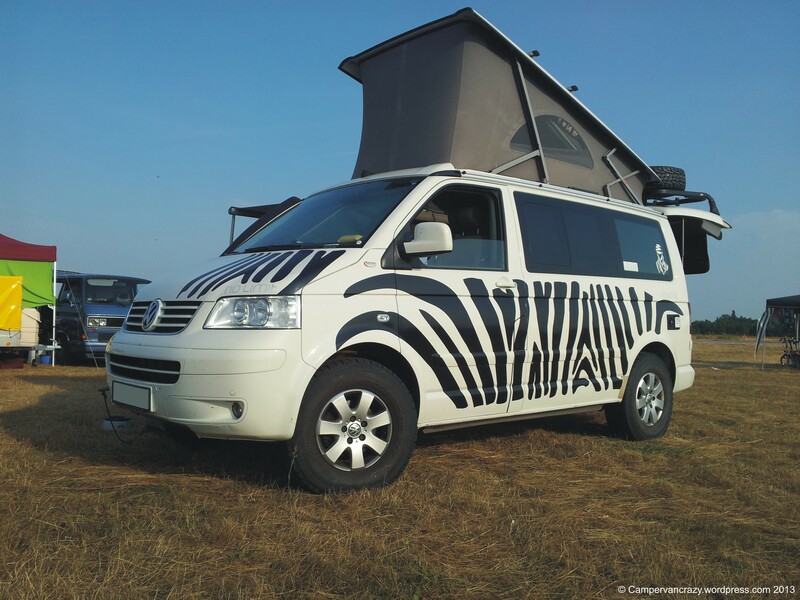 The Biggest T3 – Ever! 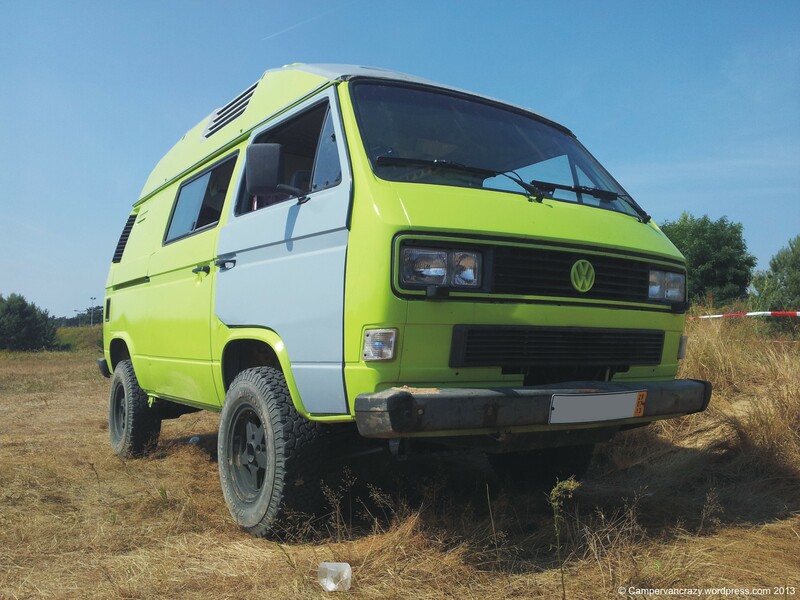 So it is out and you can download it from the Festival Web page: The aerial photograph of a T3 front, built last Saturday at the 5th Berlin VW Bus Festival from 335 Volkswagen buses! And we were part of it! 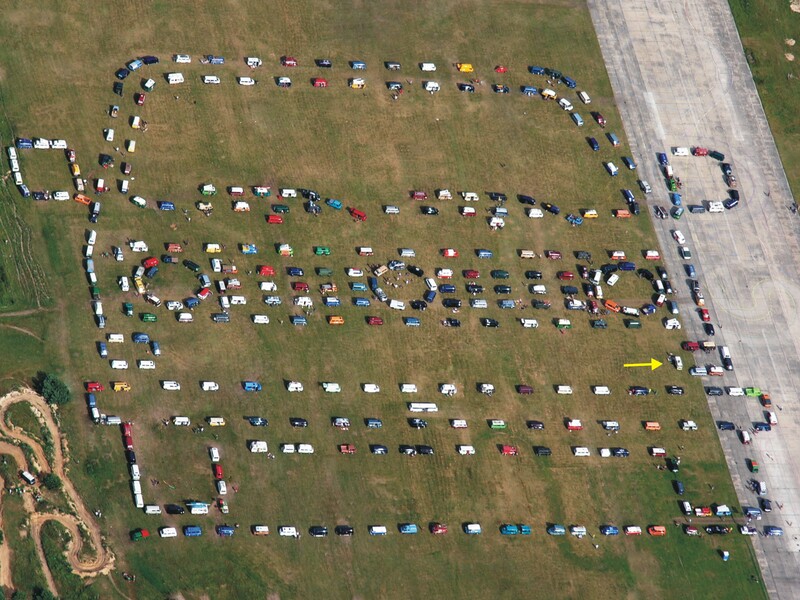 Taiga Lily is where the little yellow arrow is in the left indicator, with us on the picnic blanket next to her. Someone did a brilliant job in organiszing those hundereds of buses so precisely!